Early this year, Dropbox threw a glitzy launch event for its new photo storage and viewing app Carousel, and people went right on using the dozen other ways to keep and comb through memories. Despite Dropbox’s 300 million users, it saw less than a half million downloads on Android, and has hovered around #350 on the iOS photo app chart, falling out of the top 1500 apps overall less than two weeks after launch. But Dropbox needs photos. They’re one of the most common file types people store in its cloud, and have the emotional value that people will pay to keep safe. Dropbox can ill afford Carousel’s failure. So today it hopes a repolished and newly multi-platform Carousel front-end will help it fight iCloud, Google+/Drive, Flickr, 500 Pixels, and the rest for photo storage on the backend. 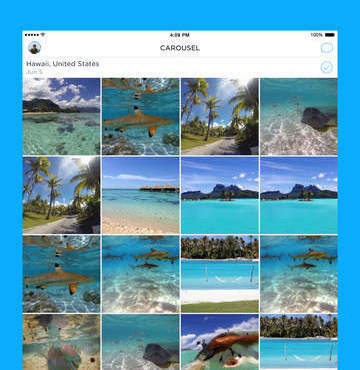 Carousel is all about combining photos on your device with all the ones you store up in Dropbox. The auto-saved cloud photos are supposed to load just as quick as the local ones, and they can all be rapidly browsed through using a “carousel” style wheel that lets you whip back to a specific point in time. A messaging feature lets you instantly send big sets of photos or videos to friends that would have taken ages to email or SMS. Now the dusty iOS and Android Carousel apps are getting a cleaner interface that highlights photos with faces over your boring, endless shots of food and sunsets you’ll probably never look at again. The app launches on iPad today and Android tablets soon to let you look at photos on a bigger screen. And most importantly, Carousel is now viewable from the web. I say “viewable” because you can’t actually upload photos to Carousel from your computer, which seems like a fatal flaw. It also lacks the scroll wheel interface that made Carousel fun to whip around on mobile, leaving the web version feeling half-baked. None of the interfaces allow any sort of photo editing, which puts it far behind the flexibility of some competitors. 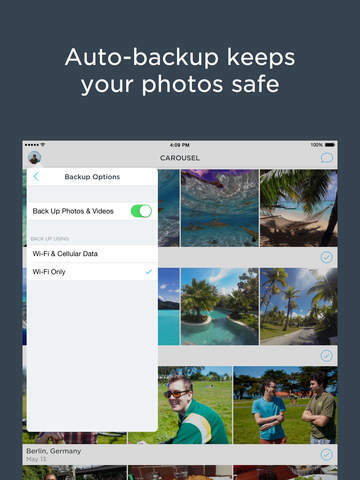 Carousel will need a more compelling product to be a serious deciding factor in where people store their photos. Dropbox is willing to wait until Carousel is more complete to see it pay dividends. Product Manager on Carousel Chris Lee refused to own up to the soggy download rates on Carousel, instead telling me “We think of this very much as a long-term bet. People have photos and videos scattered across their devices. There still isn’t one solution.” Without web uploads, Carousel isn’t that solution either, but hopefully it will get there with a few more iterations. Unfortunately, nothing’s been done to solve one of the original criticism of Carousel: the price. Dropbox users start with a free 2GB of storage, and they get 3 more if they sign up for Carousel. But most people who would care about a photo storage app have way more than 5GB of memories, which means they’ll likely need to cough up $10 a month for a terabyte of space. Lee admits that there are lots of people with more than 5GB of media to store, and that Carousel is a big up sell for Dropbox storage space. The initial free space is “a great way to experience the product. Our job is to make it so convenient for people that Carousel and Dropbox are worth paying for” Lees says. But with no middle-tier between 5GB and 1000GB, Carousel can seem expensive. On iCloud, $1 a month gets you 20GB and $4 gets you 200GB. $2 a month gets you 100GB on Google Drive. A terrabyte comes free with ads on Flickr. A $99 annual Amazon Prime subscription gives you unlimited photo storage plus a whole lot else. “We’re in a different place than services that can throw away storage because they make money elsewhere” revealing a growing competitive problem for Dropbox. Apple makes money on hardware, Google and Yahoo on ads, and Amazon on ecommerce. Storage is becoming commoditized because they can give it away as a loss leader. That means Dropbox will have to win with convenience, which it does well with, and added-value. To deliver the latter, its product will have to move faster. Taking seven months to launch an incomplete web version with no editing won’t cut it. Carousel needs more before it’s ready to ride.